Barry Myers is a man of many hats—or helmets, depending on the project. 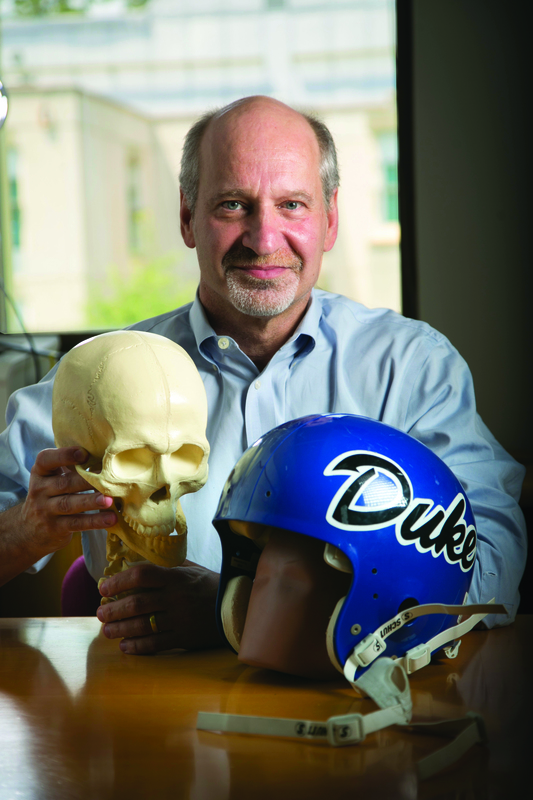 A professor of biomedical engineering at Duke University, Myers studies the biomechanics of catastrophic head and neck injuries, such as those suffered in a car accident or through contact sports like football. But in the last few years, he has built a second career as the director of innovation at the Duke Clinical and Translational Science Institute (CTSI), where he helps translate research into marketable products, and as the director of the Duke-Coulter Translational Research Partnership, where he helps support collaborative research that addresses unmet clinical needs and leads to commercial products. That research and entrepreneurial experience converged in 2016, when the National Football League and the NFL Players Association asked Myers to lead a new initiative to create and develop safer football helmets and protective equipment for players. Dubbed “HeadHealth,” the partnership between Duke CTSI and NFL’s Football Research Inc. encourages entrepreneurs and researchers to develop and market improved football helmet technologies for better head and neck safety. From his unique position at the intersection of engineering and translational research, Myers shared his perspectives on Duke’s growing strengths across the entrepreneurial pipeline. How did the Duke branch of the Coulter Foundation Translational Partnership Program get started? We were looking for a way to help biomedical engineers become more successful in translating university inventions into the marketplace. Initially we were one of more than 60 schools competing for the grant for the Coulter program. We were one of nine schools to be chosen for a five-year grant, and over that initial period we funded several startups and licenses for industry. The foundation was excited by our success and we were ultimately granted a $20 million endowment, which has been a benefit to the engineering and medical programs here. In its first 10 years, the Duke-Coulter Partnership awarded $8 million to 39 projects, yielding $489 million in follow-on funding and 13 licenses to industry. Multiple companies have also been founded through the program, including Oncoscope, PhaseBio, Sentilus, Zelanux Biomedical, Retroject, Biomimetix, Cernova, Cytex, Gateway Bio, Microelastic Systems, Element Genomics, Imageon, Celldom, Editas Medicine, and Isolere Bio. What other programs have helped foster entrepreneurial work in Duke BME? In 2005, the National Institutes of Health announced their own Clinical and Translational Science Initiative, and they were specifically looking for tools that could be translated out of universities. We were fortunate to get both the CTSI and Coulter grants at the same time, so we went from having limited resources for translational work and no project managers to suddenly having a strong resource base. From there, we hired skilled project managers to help the faculty with project development and walk them through the regulatory and commercial side of development, which has also been a great tool for the department. Why is Duke BME a good place to pursue your own entrepreneurial work? Having the two programs at Duke that are focused on entrepreneurial and translational work, and subsequently being nationally recognized for those two programs, really drew the attention of the NFL, which was interested in creating products to improve head protection. Duke has a long history of working in the field of biomechanics, especially regarding head and neck injuries, and coupled with the support from BME and CTSI, there are very few places in the country that have those tools and skills available. So Duke was really the unique and perfect place to run this program. What advice do you give to researchers who are interested in entrepreneurship? People most often have questions about finding the right home for their technology and subsequently working on regulatory work and raising capital. I’d advise anyone interested in entrepreneurship to explore the tools that are available to them—at Duke, they can work with Coulter, CTSI, or the Office of Licenses and Ventures. It’s always helpful to have someone on your side to support your projects and help you build an infrastructure of project managers who know how to make your company successful. One of the companies to arise through the Duke-Coulter Translational Research Partnership is MicroElastic Ultrasound Systems. Founded in 2016 by Peter Hollender, a research scientist in BME, the company is using technology developed in collaboration with Mark Palmeri, an associate professor of the practice in BME, to develop a handheld tool that allows clinicians to measure the elasticity of skin by using ultrasound to locally vibrate tissue. Although the tool has multiple applications for evaluating procedures in aesthetic dermatology, physicians can also use the tool to better evaluate and track skin manifestations of difficult-to-manage diseases like Graft-Versus-Host disease (GVHD). So far, the MicroElastic team has received a phase 1 STTR grant from the NIH to develop their prototype into a handheld commercial product for GVHD.